If you find this resource useful, please consider a donation. All money raised is used to offset printing, distribution and web hosting costs. You can click on any of the below donations and donate through a secure server No signups, just enter your payment information and you're done. Welcome to the web home of the Mindful Occupation booklet! 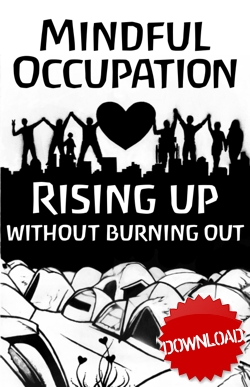 Last year, a group of us who have years of experience practicing peer-based community mental health support got together to compile a manual for organizers and participants in the #occupy movement. This is what came out of our work. We believe that there is an urgent need to talk publicly about the relationship between social injustice and our mental health. We believe that we need to start redefining what it actually means to be mentally healthy, not just on an individual level, but on collective, communal, and global levels. We know that many people at Occupy sites around the country are struggling to figure out how to build spaces of support and healing. We also know that police violence and the stresses of street protest can have very real mental, emotional, and energetic effects that are all too often not taken seriously. Our aim with this booklet is to stimulate discussion, raise awareness, provide support, contribute to maintaining a more sustainable movement, and lay the foundation for the next stage of the movement. We want it to be a living document: open to revisions and remakes. We also hope this helps start conversations. Many people are doing amazing healing work within and around the Occupy movement – street medics, health professionals, bodyworkers, herbalists, energetic medicine practitioners, radical therapists and social workers, and others. We want to facilitate more discussions and get the word out about more good practices and techniques. We have released our booklet under a Creative Commons license and our working draft is now available digitally. Our first large print run is on its way, set for late May 2012. Lastly, a next step many of us envision for some of this material is a multi-day training intended for those that identify as doing support or healing work within the activist community. If you are interested in being part of that discussion, please let us know! 3 What is Radical Mental Health? This booklet is intended to be a living document: open to your changes, critiques, and re-imaginings. We also hope it will be used as a conversation starter, not the "last word" on any of these topics. Please join the Mindful Occupation discussion forum at The Icarus Project site. This all-volunteer project runs on donations! You can send us some money via the menu in our left sidebar, or any of the following ways. Design by Mini Apple Design based on a WooTheme.